You know how I said that Olin was being incredibly well behaved and sleeping most of the night? Ha ha, um, that changed. 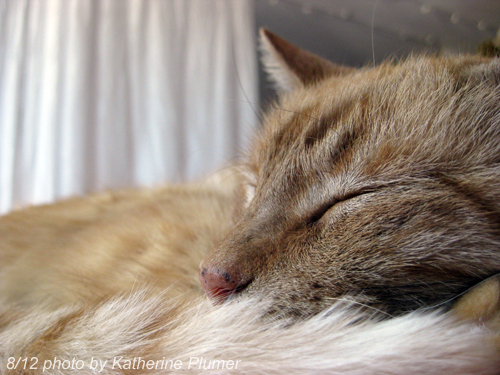 A few days after I wrote that, the dreaded "meowing all night" began. OMG. It really made me question my decision to move him up here, and really made me think I'd be taking him back down to my mom's house next time I went down there... and leaving him there. 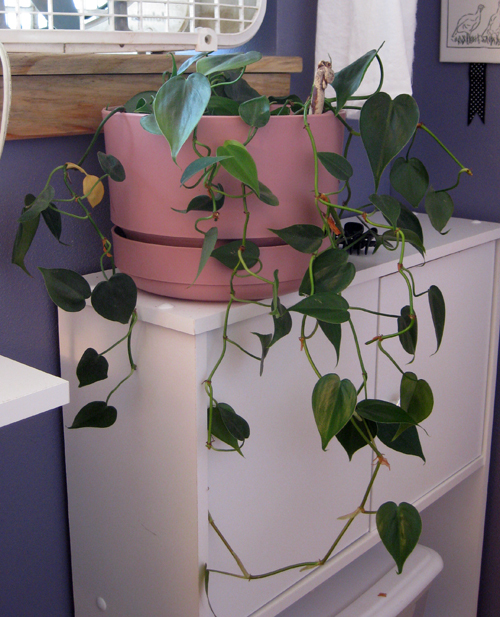 Phil is a heart-leaf philodendron that my oldest brother gave me for Christmas 26 years ago. I don't know what the average heart-leaf philodendron life span is, but that seems pretty old. I don't have a green thumb at all, gardening is not my thing, I accidentally killed the adorable cactus that one of my best friends gave me (over-watered, oops!) but I seem to do okay with Phil. Phil used to be very very lush, with huge leaves. Now Phil is like one of those old men with a bad comb-over (not that there's a good comb-over). I just try to arrange the remaining foliage in the most aesthetically pleasing manner, but there simply isn't much of it left to go around. OK, this is what you do for Phil: put some fresh potting soil with a little well-seasoned horse poop mixed in around the top of the pot. Then take the ends of the plant that are hanging down and push them under the new soil. They will take root and give the plant new life. It looks like a nice, light spot where you've located Phil, life should start improving for him soon. If Olin only annoys you 10% of the time, that's better than most marriages. Thanks, I'll try that! I have a couple cuttings in water to try to get them to grow some roots too. Pinching the long "comb-over parts" back (off) will work too. You can pinch back about half way of the length of each and then put the fresh ends of the pinched off parts in the soil. "Phils" like to be pinched back. It makes them want to grow more. Even I can't kill a Phil unless I totally ignore it and don't water it - ever. They do tend to get long and thinnish if you don't put their ends back in the pot or pinch them off.